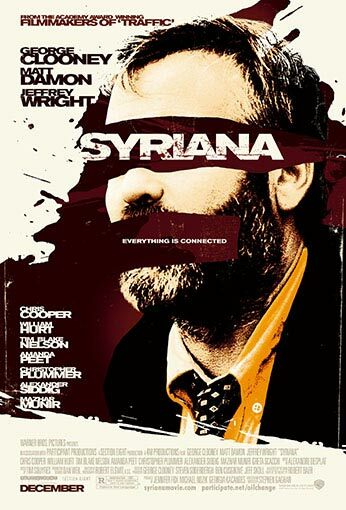 From writer/director Stephen Gaghan, winner of the Best Screenplay Academy Award® for Traffic, comes Syriana, a political thriller that unfolds against the intrigue of the global oil industry. From the players brokering back-room deals in Washington to the men toiling in the oil fields of the Persian Gulf, the film’s multiple storylines weave together to illuminate the human consequences of the fierce pursuit of wealth and power. As a career CIA operative (George Clooney) begins to uncover the disturbing truth about the work he has devoted his life to, an up-and-coming oil broker (Matt Damon) faces an unimaginable family tragedy and finds redemption in his partnership with an idealistic Gulf prince (Alexander Siddig). A corporate lawyer (Jeffrey Wright) faces a moral dilemma as he finesses the questionable merger of two powerful U.S. oil companies, while across the globe, a disenfranchised Pakistani teenager (Mazhar Munir) falls prey to the recruiting efforts of a charismatic cleric. Each plays their small part in the vast and complex system that powers the industry, unaware of the explosive impact their lives will have upon the world.